After neighbors organized strong opposition to a plan by Fairfield Grace United Methodist Church to lease a portion of its property to AT&T to erect a wireless communications tower -- including a placard-waving protest in front of the church during last Sunday's services -- the church has decided to pull the plug on the deal. The decision is a reversal of a vote by the church council, taken Sunday, to proceed with lease negotiations with AT&T despite the controversy. However, in a statement posted Wednesday on the Fairfield Grace website, church leaders said they have changed their mind and suspended lease negotiations. The church's cell tower task force, the statement reads, "has come to believe that an unfair burden that should reside with the town, the cell carrier and the Connecticut Siting Council (CSC) has been placed on the church. Further, they have come to believe that another alternative cell site would be recommended and chosen. The task force recommended that lease negotiations with the cell carrier company be suspended. The council chair accepted the task force's recommendation." The statement also says when the church "was first approached by the cell carrier company for this proposed land lease, the church's understanding was that the cell carrier company had the support of the Town of Fairfield for placing the cell site on its property. The church felt that if a cell site was going to be placed, then maybe the lease might be a blessing to help in its mission work here in Fairfield, as well as around the globe." The church "entered into negotiations with the cell carrier company with very good intentions," the Rev. Kun Sam Cho, the pastor, says in the statement. "The money from the lease would have helped us to do so much more. We are saddened at all the strife this has caused. We are people of peace." He indicated some of the lease money was earmarked to hire a youth minister, something the congregation has wanted to do for many years but cannot afford. Calls by the Fairfield Citizen to the church on Thursday for additional comment were not returned. On Sunday morning, dozens of people turned out to protest the proposed cell phone tower proposed behind the church on its property at 1089 Fairfield Woods Road. Nonetheless, the church's council later Sunday voted to enter into a lease with AT&T so the wireless carrier can move ahead with plans to erect the tower. "This was a difficult decision and one which the council took with the greatest of care," the pastor said in a Sunday statement. "I pray that we all will continue to show concern for one another and respectfully accept the decision that was made." Several protestors who assembled in front of the church property, carrying placards to promote their opposition, said Cho came out before the service to greet them and shake their hands. Krissy Dorn of Woodridge Avenue, one of the protestors outside the church from around 9 a.m. to noon, said the tower had been expected to be 100 feet high atop a 50-by-50-foot base, and within 250 feet of Fairfield Woods Middle School, Jennings School, the church's preschool and Child Link, a preschool in Jennings School. 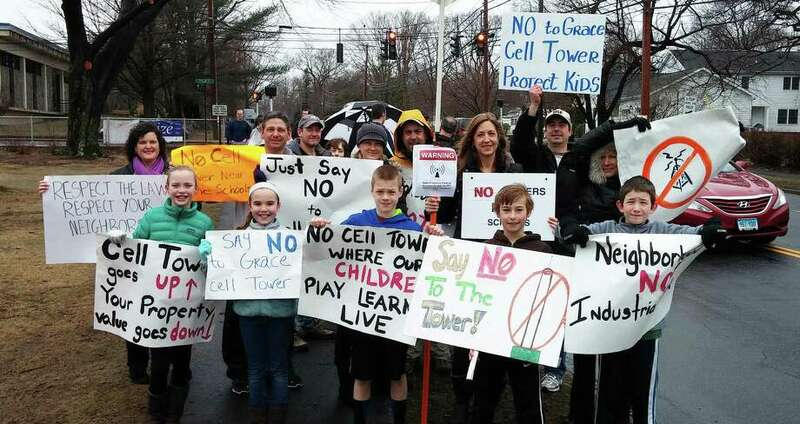 She said a total of about 1,200 children attend those schools and that a state law says cell phone towers -- because of health concerns -- should not be erected within 250 feet of schools or day-care centers, although that can be overridden by the Connecticut Siting Council. "First and foremost are concerns for children's health and safety. Having radiation emissions near our children for eight hours a day for 10-plus years is a long time for them to be exposed, especially since they're young, developing bodies," Dorn said. She said Fairfield Woods Branch Library, where many children attend programs, also would be within 250 feet of the tower's proposed location. Colleen Sullivan of Palamar Drive said a cell phone tower near 1,200 children "would seem to be in contrast to what our state statute says." John DeMassa, who lives near the church, said he was a research chemist for 23 years and that substances introduced into the marketplace later have been banned because of their effects on health. "I see a lot of the cell technology as relatively new technology, and since it is, I think there are open questions," he said. "I'm not hysterical about it, but where there's doubt and where there's children, we ought to be very conservative about how we deploy this technology." And Sullivan added, "The precautionary principle is you should decrease exposure until more is known, especially with children." Dale Allen of Tahmore Drive said children would be within 250 feet of the proposed cell tower for 10 years if they attend preschool, Jennings School and Fairfield Woods Middle School. "I get it's hard to find a good place for a tower, but in the middle of four schools? Come on. We can do better than that," Allen said. The group also said they oppose the proposed cell tower because of the negative impact they said it would have on neighborhood aesthetics and property values. "Property values will go down," Dorn said. "This is a community; it's a neighborhood. It's not meant to be an industrial park." DeMassa said he and his wife, Grace DeMassa, are "invested into this community, and being invested into this community, we're concerned." "We think it's a pretty community and we don't think there should be a light industrial look to it," he said. Kathy Caulfield of Fairland Drive said the proposed location does not make sense when the heavily trafficked Black Rock Turnpike commercial district is less than a quarter-mile away. "The church should not be doing this to its neighbors," she said. Neighborhood residents had met informally with church representatives last week asked them to have a public meeting on the proposed tower, Dorn said. "That was not done ... They just never responded," she said. Two parishioners leaving Sunday's 10 a.m. service, who declined to give their names, said they were upset by motorists who honked horns as they drove by the protestors during the service. Priscilla Bromley, a Monroe resident who regularly goes to Grace United Methodist Church after its Sunday service to have lunch and meet friends, said the honking was disrespectful. "It's insulting to the church. It really is," she said. Tony Salese, a neighborhood resident opposing the tower, said the state legislature "expressed a clear preference for not having cell towers within 250 feet of a school." "This location is the worst you can think of in terms of flying in the face of the intent of that legislation," he said.